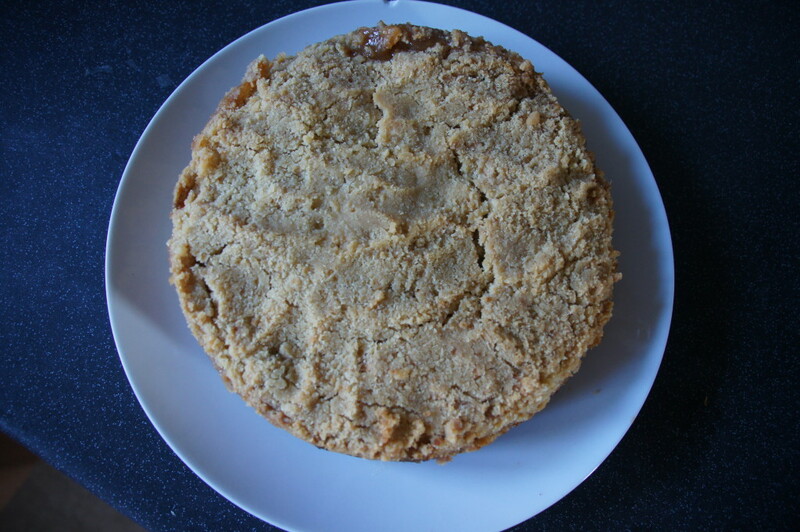 Although the name is a deep rhubarb streusel cake, this cake also contains apple. I took this into work on the same day as the whole cherry brownies I made. I thought the brownies would be finished first but no, it was this cake, which was a big hit. 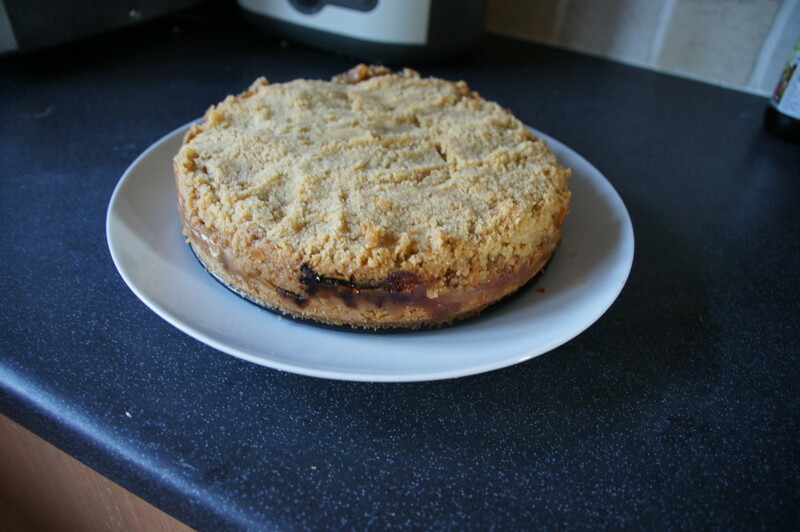 It’s very easy to make and is egg free which is an added bonus if you need an allergy friendly cake. 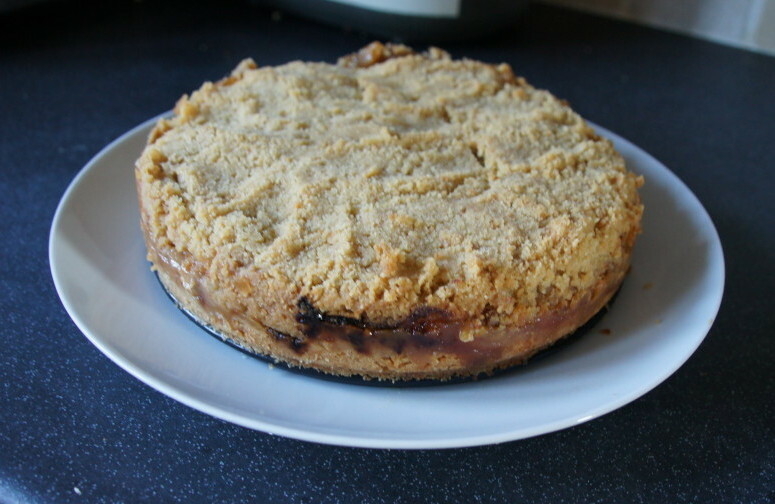 You use the same mixture to make the shortbread base and the crumble topping which also means it’s quite light on washing up (always an added bonus!). You will need a deep (at least 7cm) 20cm cake tin with a loose-bottom. 1) Heat the oven to 190°C/170°C fan/Gas 5. Lightly butter a loose-bottomed, 20cm cake tin. 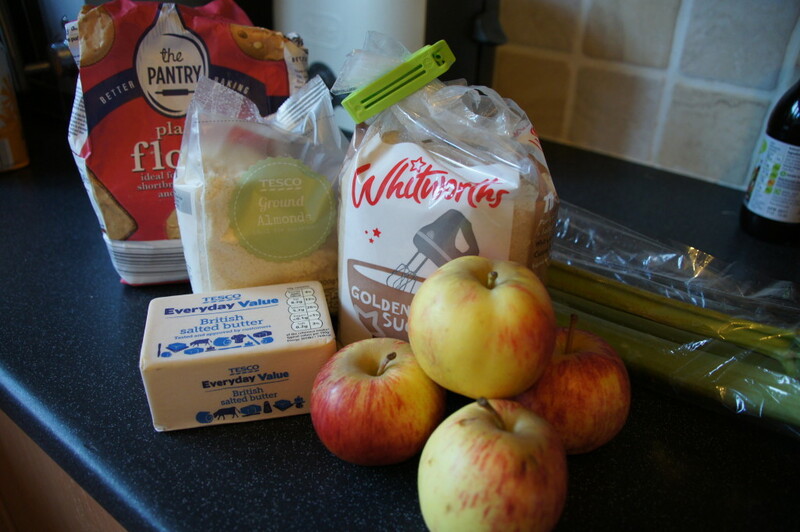 2) Toss the rhubarb and apples with 75g sugar in a large bowl and set aside. 3) Place the flour, ground almonds and the remaining 125g caster sugar in the bowl of a food processor. Pulse briefly to combine. Add the butter and whiz the mixture to crumbs (it’s very important that the butter is cold otherwise it will cream into a dough). Press half the mixture into the base of your buttered tin. 4) Spoon the fruit over the base. Tip the crumble mixture on top and level (it will come to the top of the tin but sink as it cooks.) Transfer to a baking tray and bake for 1 hour to 1 hour 10 minutes until the top is golden and crisp and the juices are bubbling at the sides. 5) Remove and run a knife around the top, and allow it to cool. Serve warm or cold, liberally dusted with icing sugar.